Hiatal hernias are a common anomaly the incidence of which increases with age. Hiatal hernias are considered one of the fundamental etiologies for gastroesophageal reflux disease (GERD). GERD is one of the most common differential diagnoses in a patient with typical angina-like chest pain. Patients with large hiatal hernias have been reported to have cardio-pulmonary symptoms as well as electrocardiographic and echocardiographic manifestations in several case reports. ,,,,,,,,,,,,,,,, Hiatal hernias should be considered in the differential diagnosis of patients with angina-like chest pain. Given the symptoms of GERD, the cardiopulmonary findings, and the high prevalence. To the best of our knowledge, we are reporting the first case of focal inferior segment ST segment elevation secondary to a large hiatal hernia. The patient is an 86-year-old white male with a past medical history of hypertension and a 12-year history of a hiatal hernia. He does not have a history of diabetes, hyperlipidemia, or coronary artery disease. He is a non-smoker, active for his age, and has no recent history of chest pain. The patient takes 25 mg of metoprolol twice a day for his hypertension and 40 mg of omeprazole daily for GERD. The patient presented to the emergency department with a chief complaint of persistent nausea. He received an abdominal film during his work-up which revealed a large hiatal hernia , which along with his persistent nausea, the possibility of gastric volvulous was entertained [Figure 1]. 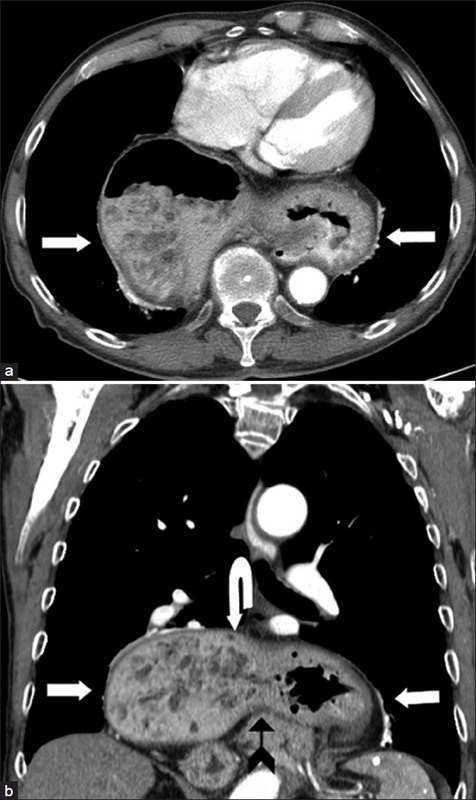 The patient subsequently underwent an abdominal CT scan that ruled out gastric volvulous and demonstrated a large hiatal hernia in which the stomach was almost entirely in the thorax [Figure 2]. An electrocardiogram while patient was in Emergency Department revealed new ST segment elevation in the inferior leads without reciprocal changes [Figure 3]a. The patient continued to have persistent nausea and started to develop pleuritic left sided chest pain. His vital signs remained stable with a temperature of 98.4, 16 respirations a minute, heart rate of 70, blood pressure of 156/63, and an oxygen saturation of 98% on room air. He was admitted for 24-h observation. His cardiac markers remained within normal limits. An echocardiogram revealed no wall motion abnormalities and a preserved ejection fraction. During the hospitalization, the patient had a number of episodes of large volume emesis, resulting in dramatic improvement of his symptoms. Repeat electrocardiogram revealed resolution of the ST segment elevation [Figure 3]b. The patient received supportive care during his hospitalization and was referred to cardiothoracic surgery at discharge. Two months later, the patient received a laparoscopic Nissen fundoplication. The procedure and post-operative course were without complications and the patient has been in good health since the surgery. Our case represents a patient with focal ST segment elevation of the inferior leads, a new electrocardiographic finding associated with large hiatal hernias. The exact mechanism of these electrocardiographic changes is not known. We hypothesize that the focal ST segment elevation in the inferior leads could be related to torsion or compression of the epicardial artery from direct pressure from the hiatal hernia. These electrocardiographic changes could also be related to rotational changes of the heart associated with compression from the hiatal hernia. This may also explain the changing depth and duration of the inferior Q-waves. Regardless of the exact cause of these electrocardiographic changes, once the patient's had repeated episodes of large volume emesis, his hiatal hernia decompressed leading to resolution of his electrocardiographic findings. 1. Gordon C, Kang JY, Neild PJ, Maxwell JD. The role of the hiatus hernia in gastro-oesophageal reflux disease. Aliment Pharmacol Ther 2004;20:719-32. 2. Voskuil JH, Cramer MJ, Breumelhof R, Timmer R, Smout AJ. Prevalence of esophageal disorders in patients with chest pain newly referred to the cardiologist. Chest 1996;109:1210-4. 3. Lam HG, Dekker W, Kan G, Breedijk M, Smout AJ. Acute noncardiac chest pain in a coronary care unit. Evaluation by 24-hour pressure and pH recording of the esophagus. Gastroenterology 1992;102:453-60. 4. 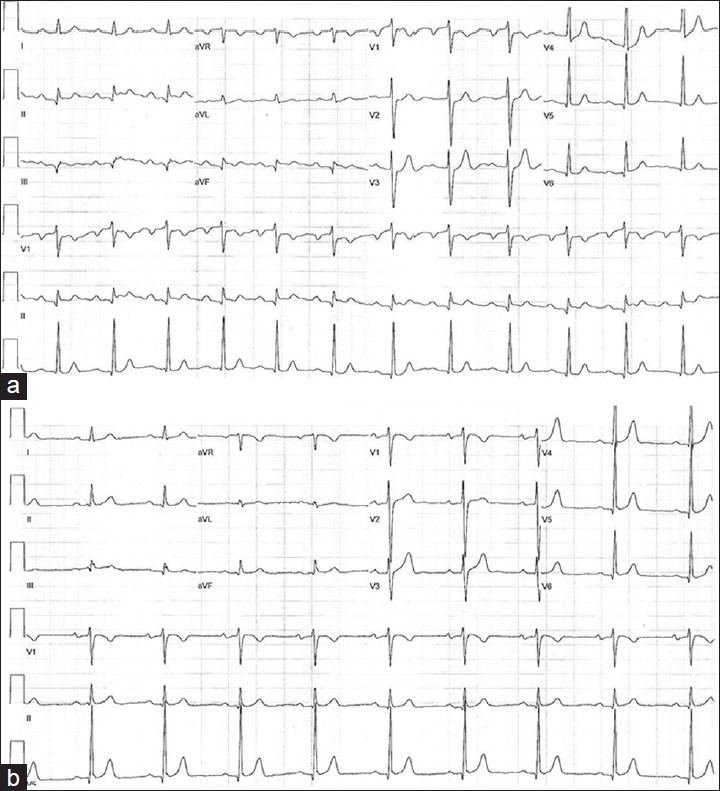 Landmark K, Storstein O. Ectopic atrial tachycardia on swallowing. Report on favourable effect of verapamil. Acta Medica Scandinavica 1979;205:251-4. 5. Duygu H, Ozerkan F, Saygi S, Akyuz S. Persistent atrial fibrillation associated with gastroesophageal reflux accompanied by hiatal hernia. Anadolu Kardiyol Derg 2008;8:164-5. 6. Tursi A, Cuoco L. Recurrent supraventricular extrasystolia due to retrocardiac stomach. Am J Gastroenterol 2001;96:257-8. 7. Schilling RJ, Kaye GC. Paroxysmal atrial flutter suppressed by repair of a large paraesophageal hernia. Pacing Clin Electrophysiol 1998;21:1303-5. 8. Hokamaki J, Kawano H, Miyamoto S, Sugiyama S, Fukushima R, Sakamoto T, et al. Dynamic electrocardiographic changes due to cardiac compression by a giant hiatal hernia. Intern Med 2005;44:136-40. 9. Zanini G, Seresini G, Racheli M, Bortolotti M, Virgillo A, Novali A, et al. Electrocardiographic changes in hiatal hernis: A case report. Cases J 2009;15:8278. 10. Buonavolonta JJ, O'Connor WH, Weiss RL. Pseudoinfarction ECG pattern caused by diaphragmatic hernia uniquely resolved by transthoracic echocardiography. J Am Soc Echocardiogr 1994;7:425-8. 11. Khouzam RN, Akhtar A, Minderman D, Kaiser J, D'Cruz IA. Echocardiographic aspects of hiatal hernia: A review. 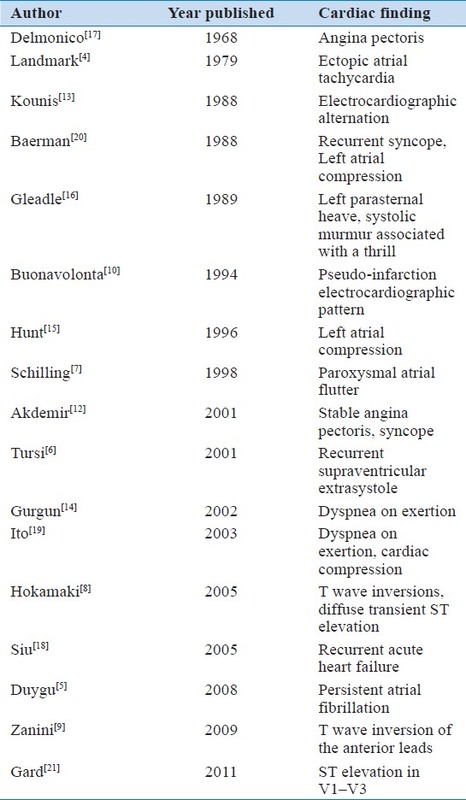 J Clin Ultrasound 2007;35:196-203. 12. Akdemir I, Davutoglu V, Aktaran S. Giant hiatal hernia presenting with stable angina pectoris and syncope-a case report. Angiology 2001;52:863-5. 13. Kounis NG, Zavras GM, Kitrou MP, Soufras GD, Constantinidis K. Unusual electrocardiographic manifestations in conditions with increased intrathoracic pressure. Acta Cardiol 1988;43:653-61. 14. Gurgun C, Yavuzgil O, Akin M. Images in cardiology. Paraoesophageal hiatal hernia as a rare cause of dyspnoea. Heart 2002;87:275. 15. Hunt GS, Gilchrist DM, Hirji MK. Cardiac compression and decompensation due to hiatus hernia. Can J Cardiol 1996;12:295-6. 16. Gleadle J, Dennis M. A thrilling case of hiatus hernia. Postgrad Med J 1989;65:832-4. 17. Delmonico JE Jr, Black A, Gensini GG. Diaphragmatic hiatal hernia and angina pectoris. Dis Chest 1968;53:309-15. 18. Siu CW, Jim MH, Ho HH, Chu F, Chan HW, Lau CP, et al. Recurrent acute heart failure caused by sliding hiatus hernia. Postgrad Med J 2005;81:268-9. 19. Ito H, Kitami M, Ohgi S, Ohe H, Ozoe A, Sasaki H, et al. Large hiatus hernia compressing the heart and impairing the respiratory function: A case report. J Cardiol 2003;41:29-34. 20. Baerman JM, Hogan L, Swiryn S. Diaphragmatic hernia producing symptoms and signs of a left atrial mass. Am Heart J 1988;116:198-200. 21. Gard JJ, Bader W, Enriquez-Sarano M, Frye RL, Michelena HI. Uncommon cause of ST elevation. Circulation 2011;123:e259-61.